SLV (iShares Silver Trust ETF) tracks the silver spot price, less expenses and liabilities, using silver bullion held in London. As we know, the past few years have not been very satisfying for precious metal bulls. And I do not think that will change in the next few years. 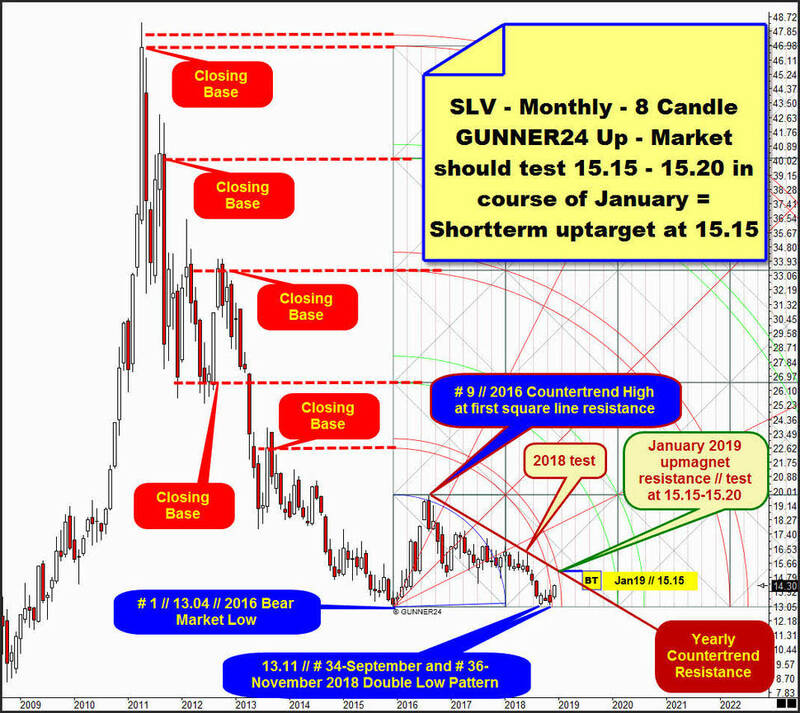 But after all, silver has formed a now quite solid looking double bottom on a yearly basis, which wants to dissolve upwards actually. The # 1 // year 2016 Bear Market Low is at 13.04$ and the two important lows of 2018 have arrived at 13.11$. This means that price made small higher low on yearly base at # 34-September and # 36-November 2018 lows and somehow it is already noticeable that the first 13.11$ bear extreme of this year was printed exactly 34 month candles after the 2016 Bear Market Low. As you know, 34 is a very high, correspondingly important Fib number and possible trend turn date, thus according to our rules the monthly trend might have turned from down to up at # 34 // 13.11$ // September 2018 Low. Hmm - valid until today, this month candle development is most bullish candle since over a 1 year and this indirectly confirms the likely monthly trend change! And although this probable underway monthly bull trend or upcycle may have started only after the successful backtest of the 13.11$ support and thus cemented 2018 Double Low of # 36-November 2018! Ok. If the lower line of a double arc in an up setup was important for the market or price - and therefore is confirmed as important - then in most cases also the upper line of this double arc will be future important for the market (a turn/a price extreme/a trend continuation trigger). And that`s why I expect SLV to test that upper line of 1st - usually stronger upmagnet resistance - in further course of this newly started monthly upcycle. And actually this should now be an important upward magnet in the course of the coming month January 2019, since then and there at 15.15$ to 15.20$ the confirmed important (pinpoint negative backtest at noted year 2018 lower monthly high) declining dark-red Yearly Countertrend Resistance runs and thus forms a very interesting future upcycle magnet with the upper line of 1st upmagnet/uptarget. ==> Strong monthly upmagnet at 15.15$ to 15.20$ for January 2019! ==> That`s why the shortterm uptarget of todays presented SLV-long setup is at 15.15$. As always, we are careful about the possible future market goals. Over the Xmas holidays, the market jumped over the BOX in which he spent 91 Trading Days. This BOX price range is 14.09$ down to 13.11$, the occured 2018 monthly Double Low. See, that until the very last trading day of November the price went just sideways. Then at open of the new month a monthly, even a resistance on yearly base was skipped and the December 2018 open triggered the likely new monthly but for sure daily and weekly upcycle which on Wednesday for the first time closed above (14.11$) the red BOX resistance horizontal. Yesterday shows bullish follow through on closing base after a massive = very trend confirming bullish upwards gap. 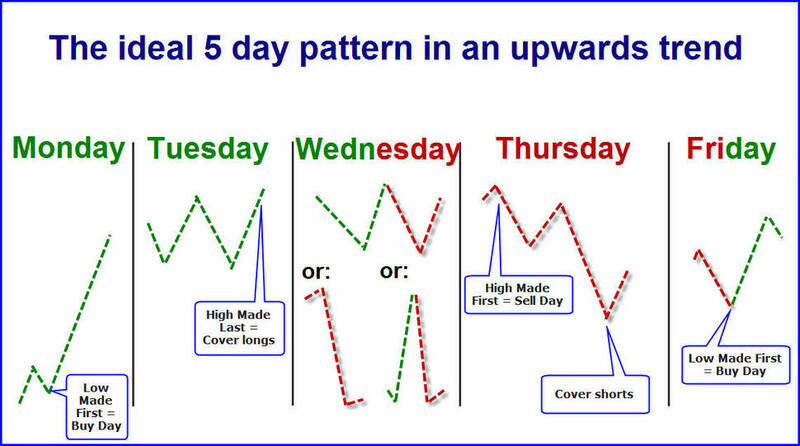 Daily momentum is strong bullish until today, without radiating disturbing signals. Momentum and price together showing higher highs and higher lows pattern! Strong, and clean daily and weekly uptrend! That's why the final overcoming of the BOX resistance should succeed and thus the next higher important resistance upmagnet should be tested in further course. Also daily chart condition offers the test of the falling Yearly Countertrend Resistance at 15.20$ to 15.15$ area in course of January 2019! ==> We should buy a backtest of currently most important supports. The 14.09$ BOX line, prior resistance usually is now first strong daily support and interesting future downmagnet. Next lower daily and weekly support is the "round" 14$ number. The 14.09$-14.00$ test/backtest would be just classic uptrend backtesting behavior and could happen as more and more traders have finished their holidays! ==> We try a long attempt at 13.99$. 13.99$-Buy-Limit order is valid until Friday, 4th of January 2019. ==> SL for the 1:3-trade setup is placed at 13.66$! ==> Shortterm uptarget is next bearish backtest of Yearly Countertrend Resistance at 15.15$ sometimes in course of January 2019. Orders: Buy-Limit at 13.99. Stop-Loss (SL) at 13.66. Shortterm uptarget at 15.15. Buy-Limit order valid till 01/04/2019. Let’s say you have got a 30.000US$ account granting you a nominal buying power of 300.000US$ up to 500.000US$ and even more, depending on your broker and instrument. In that case your trade size shouldn’t be more than 3.000US$-5.000US$ taking into account your buying power. Long Alibaba Group Holding Limited (BABA) at 151.15$ since 06. December 2018. No Stop-Loss (SL)!! Shortterm uptarget is 168.50$. Long Xilinx, Inc. (XLNX) at 85.50$ since 16. November 2018. No Stop-Loss (SL)!! Shortterm uptarget is 93.60$. Long IWM ETF at 154.40$ since 09. November 2018. No Stop-Loss (SL)!! Shortterm uptarget is 159.50$. Long Facebook (FB) at 150.00$ since 11. October 2018. No Stop-Loss (SL)!! Main uptarget is 210.00$. Long Procter & Gamble Company (PG) at 83.60$ since 18. September 2018. No Stop-Loss (SL)!! Shortterm uptarget and 2018 main uptarget at 89.20$ is worked off! 100$ is next higher uptarget! Long QUALCOMM Incorporated (QCOM) at 70.30$ since 12. September 2018. No Stop-Loss (SL)!! First uptarget at 82.00. 2019 main uptarget at 99.00. Long Intel Corp. (INTC) at 49.45$ since 26. June 2018. No Stop-Loss (SL)!! 2018 uptarget at 57.25$. Long Vocera Communications, Inc. (VCRA) at 27.75$ since 13. June 2018. No Stop-Loss (SL)!! First uptarget at 32.23$ is worked off. 2018 uptarget at 35.70$ is worked off! Long Cree, Inc. (CREE) at 40.32$ since 27. March 2018. No Stop-Loss (SL)!! Shortterm uptarget at 48.40$ is worked off! Long Micron Technology, Inc. (MU) at 52.00$ since 28. March 2018. No Stop-Loss (SL)!! 2019 main uptarget at 70.50$!! Long SPDR S&P Biotech ETF (XBI) at 87.20$ since 04. January 2018. No Stop-Loss (SL)!! First uptarget at 93.50$ is worked off. 2018 main uptarget at 100.00$ is worked off! Long iPath Bloomberg Nickel Subindex Total Return ETN (JJNTF) at 14.87$ since 09. November 2017. No Stop-Loss (SL)!! Shortterm uptarget at 16.25$. 2018 main uptarget at 20.00$. Long Rambus Inc. (RMBS) at 14.35$ since 25. October 2017. No Stop-Loss (SL)!! Shortterm uptarget range at 15.80$-16.55$. 2018 main uptarget at 18.55$. Long Southern Copper Corp. (SCCO) at 41.10$ since 09. October 2017. No Stop-Loss (SL)!! Shortterm uptarget at 46.00$ is reached. Long Pernix Therapeutics Holdings Inc. (PTX) at 5.50$ since 15. May 2017. No Stop-Loss (SL)!! First uptarget at 9.00$. Midterm uptarget is 15.00$. Long Pretium Resources Inc. (PVG) at 11.00$ since 27. February 2017. No Stop-Loss (SL)!! Shortterm uptarget at 14.35$. Long Pretium Resources Inc. (PVG) at 11.50$ since 10. February 2017. No Stop-Loss (SL)!! Shortterm uptarget at 14.35$. Long Freeport McMoRan Inc. (FCX) at 14.30$ since 15. December 2016. No Stop-Loss (SL). Shortterm uptarget at 16.43$ is worked off. Midterm uptargets at 22.00$/24.00$. Long Torex Gold Inc. (TXG.TO) at 32.80 CAD$ since 09. September 2016. No Stop-Loss (SL)! Shortterm uptarget at 39.00 CAD$. Long McEwen Mining Inc. (MUX) at 4.60$ since 19. August 2016. No Stop-Loss (SL)! Shortterm uptarget at 5.50$. Midterm uptarget is 6.00$. Main target is 7.40$. Long United States Steel Corporation (X) at 17.30$ since 24. December 2018. Stop-Loss (SL) at 16.75$. Shortterm uptarget is 22.90$. Long EURUSD at 1.1375 since 18. December 2018. Stop-Loss (SL) at 1.1295. Shortterm uptarget at 1.1655. Short Kirkland Lake Gold Ltd. (KL) at 25.00$ since 18. December 2018. Stop-Loss (SL) is a weekly close above 25.60$. Shortterm downtarget is 21.29$. Long Infosys Limited (INFY) at 9.49$ since 09. July 2018. Stop-Loss (SL) at 8.80$. First yearly uptarget at 11.00$. Main uptarget at 12.00$. 2:1 Stock Split on 09/12/2018. Long Cisco Systems, Inc. (CSCO) at 40.80$ since 06. April 2018. Stop-Loss (SL) at 39.70$. Shortterm uptarget at 44.40$ is worked off. 2018 main uptarget at 47.50$ is worked off. Long eBay Inc. (EBAY) at 41.00$ since 09. February 2018. No Stop-Loss (SL)!! Shortterm uptarget at 47.40$. Long Sociedad Quimica y Minera de Chile S.A. (SQM) at 60.00$ since 16. October 2017. No Stop-Loss (SL)!! Shortterm uptarget is 66.90$. 2018 main target at 77.00$. Long Hudbay Minerals Inc. (HBM) at 8.10$ since 08. September 2017. No Stop-Loss (SL)!! Shortterm uptarget at 11.05$. Main uptarget for 2018 at 12.00$. Short S&P 500 Index at 1880 since 14. January 2016. No Stop-Loss (SL). Shortterm downtarget at 1740. Long Market Vectors Junior Gold Miners ETF (GDXJ) at 43.09$ since 09. July 2014. No Stop-Loss (SL). Longterm Buy-Target in 2016 is 60.50$. 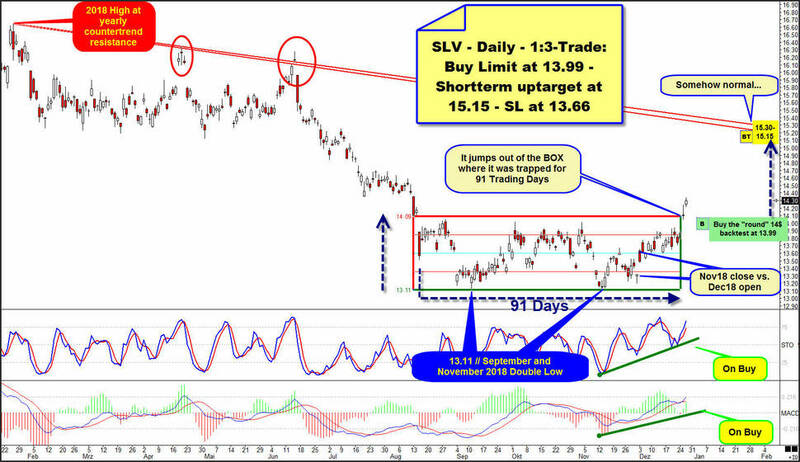 Long GLOBAL X Silver MINERS ETF (SIL) at 13.79$ since 18. March 2014. No Stop-Loss (SL). Shortterm target at 15.48$. Main targets 17.42$ and 20.00$. Short S&P 500 Index at 1820 since 11. February 2014. 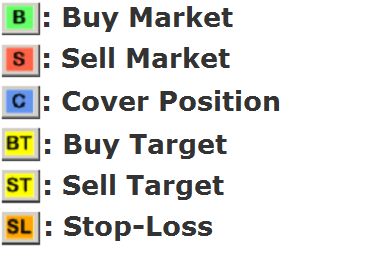 No Stop-Loss (SL). Shortterm downtarget at 1740.